I’m fighting to get out of bed this morning. Today, today my head is fitted for a mask to battle my brain cancer. We have to re-look under my skull to see if my cancer has grown in the 2 weeks I opted for chemo first. Every pain, every headache, the fear of larger brain tumors fills me with dread. But, the grace, the big and little grace in each moment keeps me looking for hope. 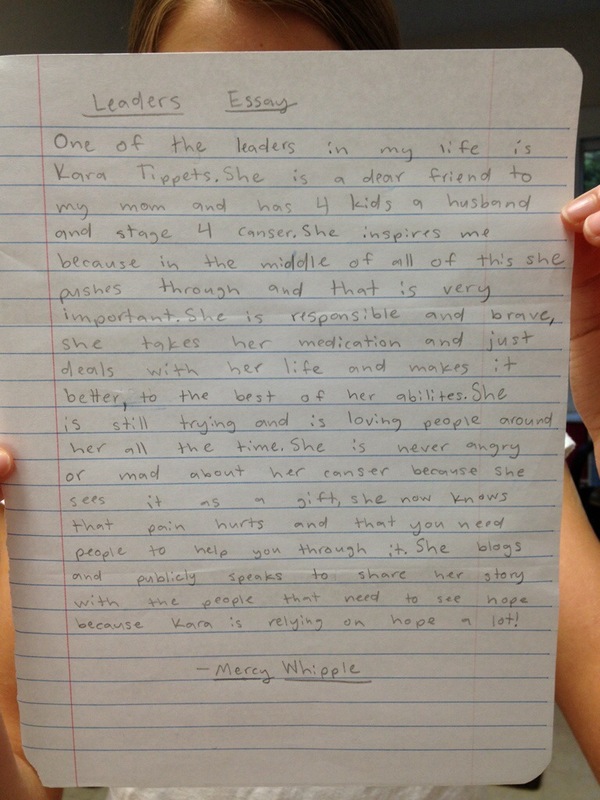 A daughter of a dear friend wrote a paper for school about me. My friend shot a picture of it and sent it to me last night. That a young woman would see my story and see my fight for hope—well, that’s just goodness prompting me to get my behind out of bed this morning. Hope is always there, but sometimes I have to dig deeper to find it. Sometimes I need your help to point me the right direction. Cancer in your brain, well, that can deflate the most light of spirits. Each morning I’m waking to an inbox full of love, reviews of The Hardest Peace that take my breath away, and countless prayers for my heart. I’m blessed, but this journey is hard. So hard. Today, I see about my brain. Today, I meet with a doc interested in helping me manage my pain. Then tonight, tonight, tonight!!!!! I get to go to one of the last Red Rocks shows of the year. A dear friend and reader bought me tickets to take my people to a concert. I was feeling anxious about how I would manage it, and then an old high school friend decided to jump in a car and drive to my side. I asked her if she would mind driving the bigs and me to a concert at Red Rocks. So tonight, I get to end this hard day at my happy place listening to Christian bands proclaim the words in song I need to hear. Shhh…the girls don’t know yet. But I will have a sweet old friend by my side, my girls near, and music I love in the greatest venue that ever was.... Now let’s hope I can climb the endless stairs. I bet I can. Because some things are just worth the effort beyond how you feel. Red Rocks is that place for me.